Get the free Sanctum Secorum #18 Companion HERE! 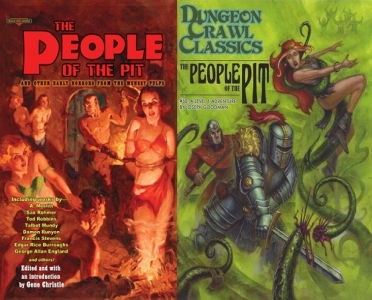 “People of the Pit features a pair of prospectors, Starr Anderson and the narrator, Frank, who are exploring the North, looking for gold. There are hints of a backstory between the two men, painting them as more than mere prospectors and it creates an anticipation for oddness to come. We are then introduced to a secondary narrator. A man who, in classic fashion, crawls (near-dead) into the men’s camp. And the manner of his crawling is horrific in itself. This is no collapsing half-stagger, no dragging himself along the floor, but as the narrator says, ‘it was like a baby crawling upstairs. The forepaws lifted themselves in grotesquely infantile fashion’ . On top of this, he wears a band of gold round his waist, and a chain. Gold, of course, is what has brought the explorers to this place, but when they remove it, ‘it was like no gold I had ever handled. […] it had an unclean, viscid life of its own. It clung to the file. […] It was – loathsome’ . Something is clearly not right when a man in search of gold actively throws it away. Welcome to the Sanctum Secorum podcast where even attending a convention cannot disrupt things. While the Keepers of Mysteries attend Gamehole Con I, the Gatekeeper of the Sanctum, bring you the latest episode. Tonight the Keepers discuss a story by Abraham Merritt and bring it to your DCC table!